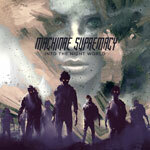 Machinae Supremacy claim that they play an 80's video game kind of metal and naturally the band's music therefore becomes a little computerized overall. To me this statement might be true, yet I wouldn't disagree if someone would label this music as a modern type of hard rock too, where focus for the most part is on bringing forth catchy choruses and to maintain a lighter appearance and pretty much keep it to a rock radio level. It's very melodic all over the record, without getting too greasy and soft. Most songs end up in more or less one department and diversity seems to be nothing that they strive for or at least put a greater effort on making, besides putting a rather nice ballad on the record and including one instrumental track as well. The vocal performance of Robert Stjärnström has, technically, a little bit more to wish for, yet his voice works rather fine emotionally to the music. I've been thinking if this maybe is slightly too modern for a metalhead like myself because the metal elements and especially the riffs are often flooded by all the programmed stuff, but no matter how I twist and turn I must say that I like the music that the band is able to come out with in the end anyway. It's simply put just quite a few songs that are appealing to my liking and maybe Into The Night World will make the boys' career boost a little bit finally.